The Item Info screen is a one-stop shop for viewing all information related to a particular Item. At the top of the screen are vital stats such as the Item Type, QB Type, and Item Group to which this Item belongs. Additionally, you have a General Info section that gives a running tally on year-to-date sales and purchases, how much of the Item you have on hand, how much on order, and your next order's ETA. ...and you'll be taken to the New Item screen, with the Item's info already filled in. Just make any needed adjustments, and then save it off. Status. Indicates the current inventory status for current Item at all locations. Lot/Serial #s. If the Item makes use of lot or serial numbers, this tab will keep track of the various lot/serial numbers you currently have in stock. Vendors. This provides a list of all approved Vendors who sell the Item in question. On Order Detail. Shows a list of all purchase orders that contain the Item, the quantities of it you have on order, and the total amount you're spending on the Item for each transaction. Required Detail. 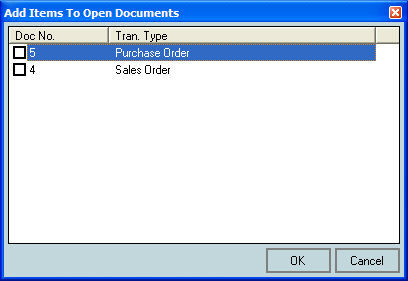 Shows any sales orders or work orders where the Item is listed but not allocated or shipped. Transaction List. Provides a complete listing of all transactions that are related to this Item, including sales orders, purchase orders, ship docs, receive docs, and returns. Related Items. Shows a list of Items that are related to the current Item. Components. (Assemblies only) Shows the component quantities as well as the quantity of finished goods ('Can Make') that can be produced from the available components. Not all tabs will show up for all item types. For example, you won't find a Status tab for non-inventory parts. Just check the appropriate box and click OK. You may select only one document.